Being part of an NGO was never a dream for me while I was growing up. My 6th grade year book will tell you that I wanted to be a writer. When I was in high school, I wanted to be a news anchor (or something like that), then when I got into college, I wanted to do marketing and PR. Eventually my quest to land my dream job has taken me into being hired by a Non-Profit Organization. As years go by, I have come to realize how this is the kind of job I'd really want to be doing. I don't just get paid for what I do, but I also get to help people in the process. But I tell you, life in an NGO isn't a walk in the park. It takes guts and a big heart to last for more than a year. For starters, (1) you don't get paid much. I mean, seriously, it's an organization that focuses on helping people why would you want and expect to profit so much from it? ; (2) Multitasking is a talent you NEED to acquire. You see, because it needs to limit its expenses and focus more on giving back to people, hiring is a thing that needs to be discussed thoroughly. Like in my case, I am the Marketing and Communications Officer so I do the planning, the reporting, the graphics, the AVPs, the covering of the events... From the top to the nitty gritty of things... I do those. But hey, I am not discouraging you to go in an NGO. I say, if your heart tells you that it wants to serve the people, by all means be my guest. It may not be easy but it sure is satisfying and I remain happy and blessed at the end of the day. Currently our organization, SHARING, is looking for volunteers who will be interested to join our activities and spread the word about our initiatives. And so for the month of June, we have two activities which you might be interested to be part of. 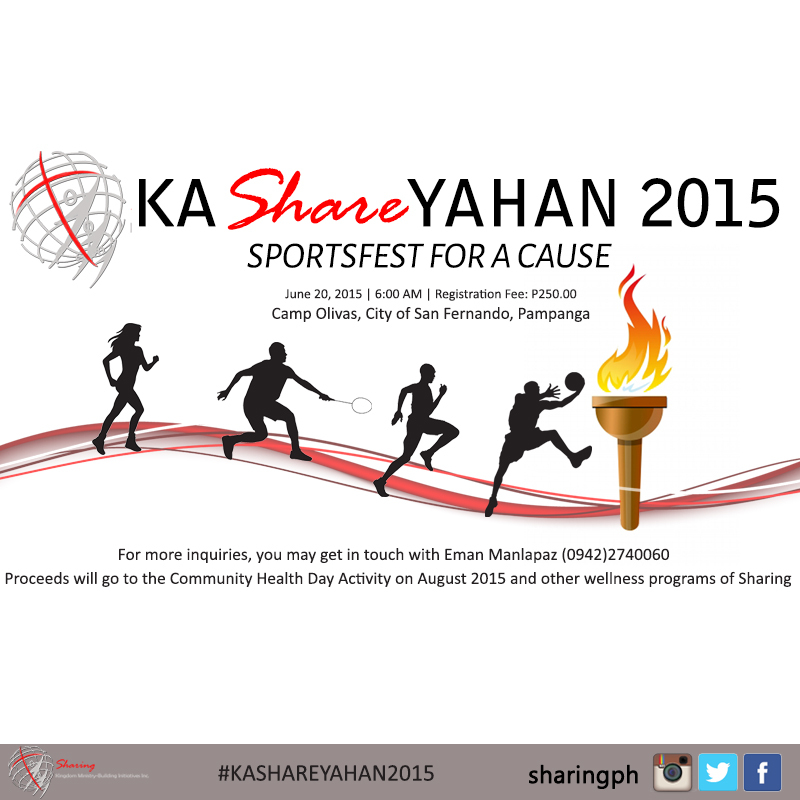 The KaSHAREyahan 2015 is a sports fest for a cause that will help support and fund our Community Health and Nutrition Program Initiatives. There will be a basketball, badminton, and Filipino Games competition, and as well as a fun run and a hiphop dance exercise open for all its participants. There will be a registration fee of P250 and, mainly, its proceeds will be used for the medical missions on August and the rest of the remaining funds are for our other initiatives under the Community Health and Nutrition Program of SHARING. This event is open to all so if you're interested, you may get in touch with Eman Manlapaz at (0942) 2740060. 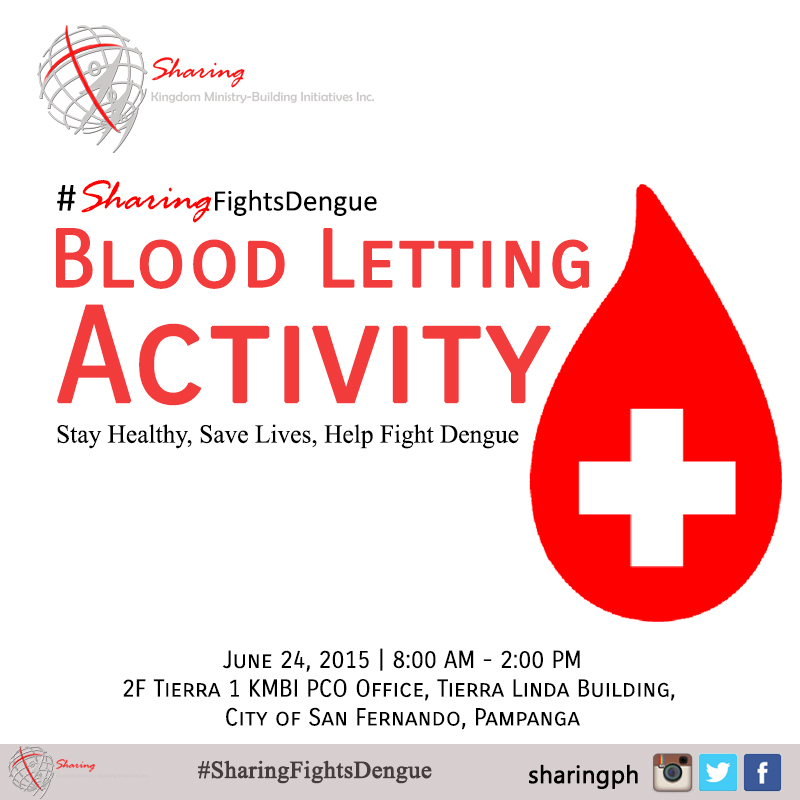 In line with the Community Health and Nutrition Program of SHARING, we joined in the Dengue Awareness Campaign of the Department Of Health and we would be sharing tips in our social media pages in order to raise awareness. Aside from that, as part of the resolve, we organized a Blood Letting Activity on June 24, 2015 at our office in Tierra Linda Bldg. at San Fernando, Pampanga. Should you be interested to join, you may get on touch with me at (0925) 8252462. We are also still looking for bloggers who would love to volunteer and partner with us. If you want to know more about SHARING, what we do, and how to volunteer and be one of our partner bloggers, email me at: gellie.abogado@sharing.ph. Hope to work with you guys soon!